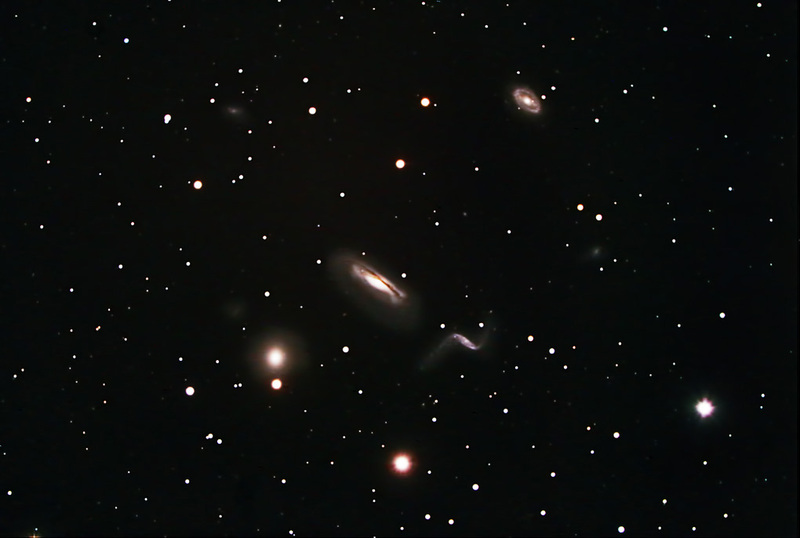 The Hickson 44 group of galaxies includes NGC 3190, the large spiral galaxy near the center of the frame. It is viewed nearly edge-on as prominent dust lanes are visible in it. The barred spiral galaxy to the lower right is NGC 3187. The spiral galaxy at the upper right of the frame is NGC 3185. This is also a barred spiral. Finally, the group includes NGC 3193, an eliptical galaxy to the lower left of NGC 3190. Several distant galaxies are also visible in this image. All the members of this group are interacting and the gravitational forces have disorted their shape somewhat. Images were focused using the camera' live view function. Subframes were calibrated, aligned, and combined with ImagePlus. The final image was adjusted and cropped in Photoshop. Topaz DeNoise was applied. Shot from my backyard observatory in southeastern Minnesota on 3/29/14. Temp: 20F; seeing was average. .